The Author collected as much common sense as he could muster – and broke out the winch. Reunions come in all shapes and sizes. Family reunions bringing large families together to, in some cases, meet and reconnect with distance relatives. High-school and college graduation reunions often accompanied by reuniting of cliques and offering an opportunity to compare job titles and baby pictures. And who doesn’t get a bit excited when their favorite band from their childhood puts aside differences and brings the original lineup back to the stage? Attempts at a Toyx4 Reunion ideas would pop up from a random person on a semi regular basis as social media offered an opportunity to reconnect (ToyxForum long since defunct). These ultimately resulted in gathering for breakfast, stopping by a car show or the once-a-year “hey! We’re back in town – let’s get dinner!” request from those who had moved away. But wheeling? A Toyx4 “event”? Always received with great enthusiasm, the event simply never materialized. 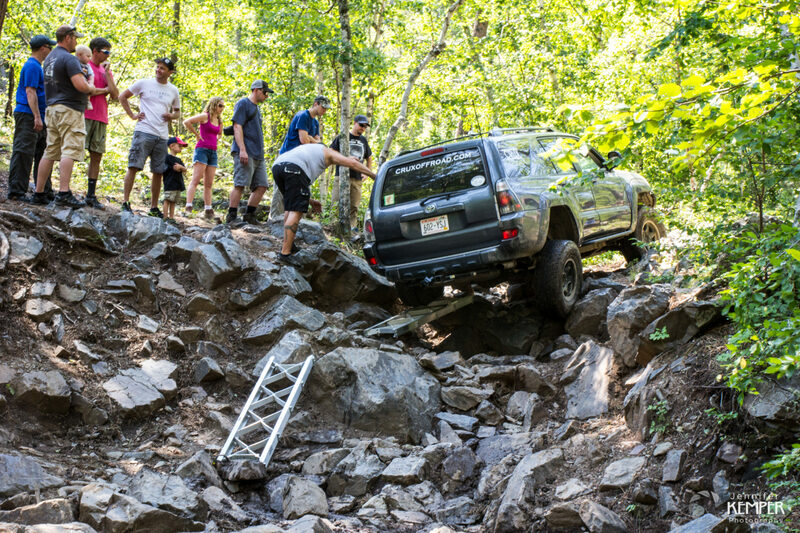 Jeremy from Crux Offroad demonstrates his unique ladders to get his 4th gen 4runner up Pinion Falls. Enter Black Hills Cruiser Classic 2016 and a random social media suggestion that we all ought to attend. Unlike other attempts at a reunion, this one took. While the majority of (former) club members still hold down the fort in MN and Wisconsin, some drove in from as far as Tennessee. All looked forward to connecting. All looked forward to reminiscing around the campfire (unfortunately, no fires this year). Some folks just looked forward to “getting there” as they their travels proved more eventful than desired. Dakota Territory Cruisers (DTC) once again hosted the BHCC out of Wild Bill’s campground outside of historic Deadwood, South Dakota. Wild Bill’s is a great full-service facility surrounded by beauty, complete with a creek running through the middle. Tech inspections started Wednesday, July 20 followed by a group welcome and drivers meeting that evening. Folks from all corners of the country arrived (and some from Canada), unloaded, settled down, caught up and made new friends. Three days of Trail Rides scheduled – with something for everyone – all lead and managed by the DTC volunteers. The event crescendo is an event dinner and raffle on Saturday night, offering further opportunity to connect and tell tall tales. The Toyx4’s brought a variety of rigs. From the Woodmansee’s expedition-equipped 2nd generation Tacoma, to a number of FZJ80/LX450’s, to a relatively stock FJ40 and a Tacoma. Thursday morning, started the trail rides, and the first unofficial “official” Toyx4 Wheeling Event in many, many years. All piled onto the “Jake Bypass” trail, for some, resisting the peer pressure to go hard. Rated a 3+, the “Bypass” is Jake (rated 4) with the intent of taking the bypasses. A perfect start to a weekend, especially for those who haven’t been behind the wheel in a while. 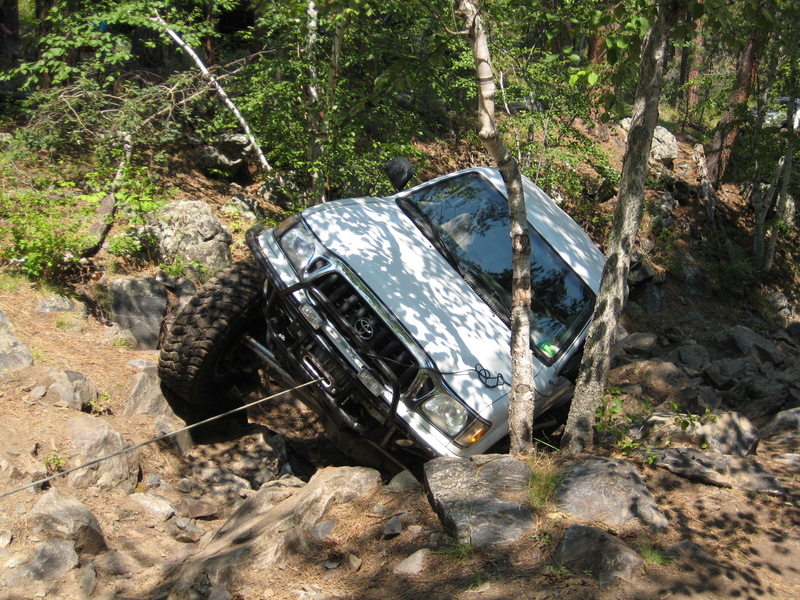 The group consisted of 15 rigs, large by comparison to th eother groups on the trails that day. Ironically, the group crossed paths with those running Jake and a few broke-off to attempt Pinion Falls and other obstacles. Peer pressure and all. Greg Kemper eases his Lexus down the waterfall. A day of familiarizing oneself with wheeling again, Friday found most of the members joining the crew headed towards Iceman. A 4+ rated trail, the group consisted of everything from beautiful IFS 4Runners and Tacomas to luxury, leather, A/C and Bluetooth clad LX450’s. A beautiful trail with many optional lines, a few bypasses and some areas to play, Iceman proved to be a great experience equipped with Ice cream provided by the Miller family. Saturday saw the Toyx4’s scattered a bit. Being the beautiful area as it is, folks had an opportunity to visit Deadwood, Leed and other historical areas while others spent the day on the trail, some hitting harder trails, others enjoying the beauty that easier trails offered. The crew came back together at Wild Bill’s campground for the traditional DTC event dinner – with great food, drink and desert. 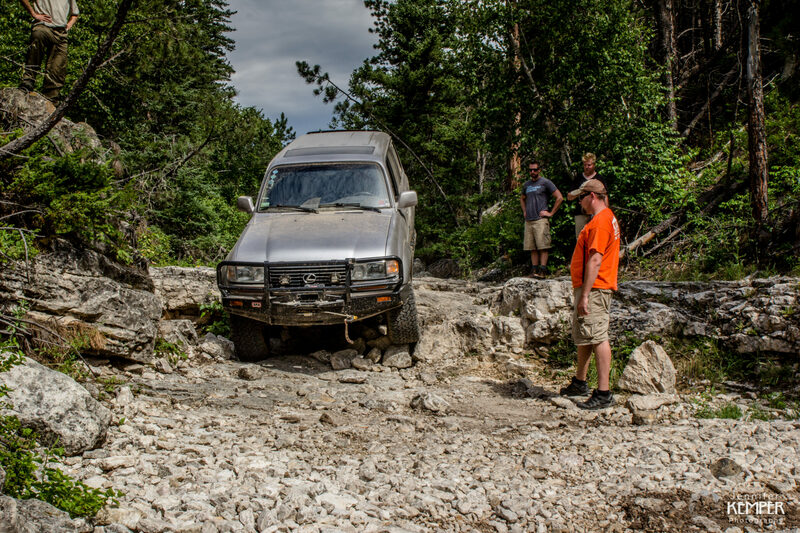 After everyone was satisfied with a dinner of steak and chicken, raffle tickets were held close as the Dakota Territory Cruisers raffled off everything from gift cards to Addicted Off-Road, to recovery straps, to a free entry to next year’s Black Hills Cruiser Classic. One challenge of reunions is that many end and are put to rest for five, ten or even twenty years. While the Toyx4’s have long since grown up and moved out of the house, the 2016 Black Hills Cruiser Classic, while currently referred to as a reunion, will likely be rebranded “first annual” as plans for 2017 are already underway.